Whatever happened to spontaneous synchronous 1:1 conversations? A college friend and I were reminiscing about how we used to have lengthy, meaningful conversations on AOL Instant Messenger (AIM) when we were back in high school and college. 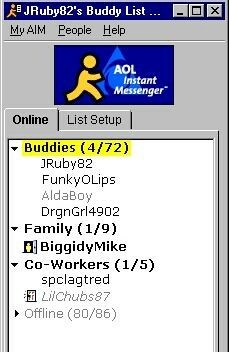 I’d be up late and bored so I’d sign on to AIM, scan my buddy list and message ‘sup’ to whichever of my friends were online at the time. It was the easiest way to talk to friends about anything and everything, whether late at night, during class, to friends across the hall or on opposite coasts. When you signed on, there was almost always someone to talk to and you were likely on for hours at a time. Sometimes you’d be multitasking and switch back to an AIM window when it started blinking, and other times you’d be focused intensely on that one chat window with the person you were crushing on at the time. Even with all the crazy screen names (e.g. SuPaFLyBoi85 or aZnGuRL86), AIM was likely responsible for hundreds of thousands of new relationships and deepened friendships. If you grew up before the advent of the smartphone, you can surely relate. Nowadays, despite the proliferation of communication technology, those magical conversations seem to come far and few between. What happened? Let’s first examine how communication technology has evolved since the early days of AIM. For a framework to analyze this, I turn to an excellent essay by Ben Rubin, founder of Meerkat, a live video broadcasting app (that had a spectacular run until Twitter’s Periscope came along). In his analysis, Ben maps communication technology along two axes: (1) synchronicity and (2) audience. It’s interesting to see the how 100 million+ user consumer apps have targeted certain user psychologies to carve out a niche. 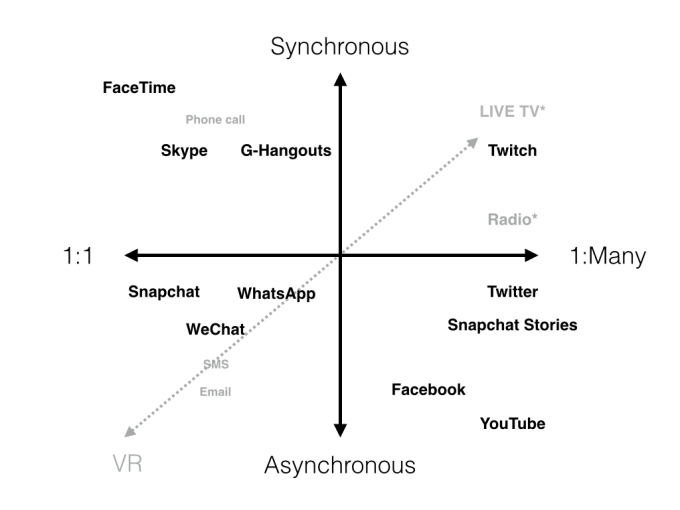 As Ben points out, there has been less focus on the ‘synchronous / 1:Many’ quadrant until recent advances in data bandwidth and smartphones have enabled live video broadcasting by anyone and from anywhere, e.g., Meerkat and Periscope. Our interest, however, is in the top-left corner of the map — the ‘synchronous / 1:1’ quadrant. Here is essentially where basic communication began — from face-to-face conversations to phone calls to online chat to video chats using Skype, Hangouts and FaceTime. And this quadrant is where we find AIM conversations. Arguably the first widely adopted consumer messaging platform, AIM enabled on-demand social interaction for the millions of people coming online in the 90's. It started as a chat feature for AOL users and then as the web opened up AIM became available for anyone with an internet connection. It wasn’t a complicated application but there were certain features that helped it become an addictive mode of communication. Back then, people had “buddies”, not “friends”. The proto-Facebook without the profile photos and real names. I scanned this to see who was on and wanted to talk to. The barrier to starting an AIM conversation always seemed lower than calling someone. Maybe it was because you knew that whoever was online was also chatting with multiple people, and that you would not occupy 100% of that person’s attention unless they wanted for you to. The opportunity for you to individualize your anonymous online identity (while letting people know that you were an aZn GuRL born in ‘86). The ability to have intimate real-time conversations with numerous people at the same time was amazing. This was something that could not occur in real life or over the phone — only on AIM. We were in the early days of the internet and we brought the social norms and conventions of a face-to-face or 1:1 phone conversation online. ‘brb’ or ‘bbl’ or ‘ttyl’ are conventions from when we used to have to give our full attention to that one person at that time. When you’re on the phone, you don’t just hang up, you say ‘bye’. When you were on AIM, you didn’t just put up an away message or sign off without saying ‘ttyl’. You always started fresh when you signed on and instant messaged your buddy. Your chat window didn’t have remnants of old conversations or tell you exactly how long it’s been since you last messaged each other. It was a blank window every time. 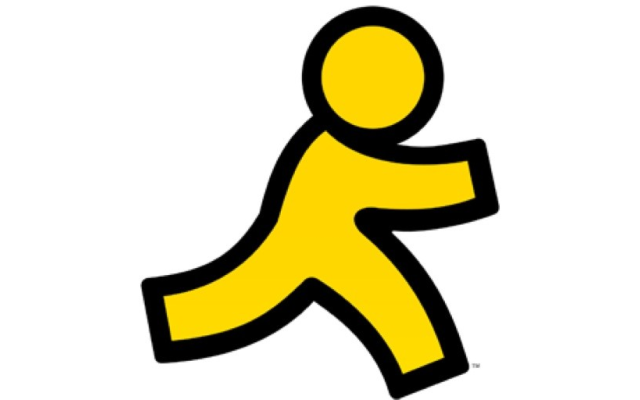 When you were on AIM, you were on AIM. You sat at your computer and your full attention was devoted to chatting with whoever it was that was online at the same time. You were fully present. In fact, your message wouldn’t be delivered to people who weren’t online at the same time! With the advent of mobile phones and supercomputers-in-your-pocket, we are now always connected — we’re never ‘away’ anymore. And so, spur-of-the-moment communication has become mostly asynchronous — you just blast it out to the person(s) you’re trying to reach and wait for them to reply back at their convenience (if at all). There is no ‘I’m going to sign onto AIM and begin chatting with my online friends in real-time’. If you want to have a synchronous conversation, you need to schedule a phone call or a coffee chat. Those magical experiences of just chatting with whoever’s online seem to have been lost. Messaging has evolved into many, many more forms, and AIM still happens to be around, along with its descendants Google Chat and Facebook Chat. So maybe we (or, I) just got old and life happened. Maybe the young whippersnappers are all using new mobile apps to have meaningful conversations via text or Snapchat. But why don’t we have a messaging platform that fosters spontaneous encounters like AIM did? Or do we? Synchronous. Only able to message friends who are intentionally online at the same time. No chat history. Like Snapchat, no history of chats once you sign off. Tiled chat windows. Swipe through your chat windows. Sign on/off. Intentionally sign on and off. No one is always on. Status message. Everyone fills out a short status when signing on and which resets when signing off. I’m sure there are some holes but I think there is some magic recapture here. Not only would I be able to go online to see who I could talk to, but I would also finally be able to bring back my AIM screen name ______________ !